Rice flakes ( also known as beaten rice / poha) is a favorite snack item for many of us. Here's a recipe for you to try out. Onion (finely chopped) - 1 no. Potato (boiled and mashed) - 1 no. Wash and soak rice flakes in small quantity of water for a few minutes till it becomes soft. 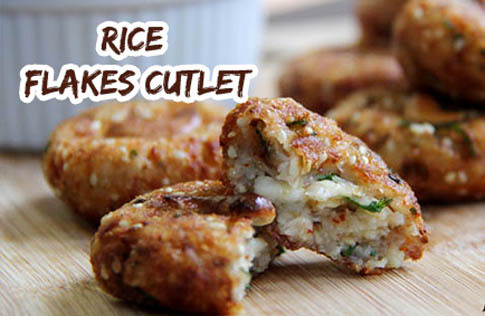 Except coriander leaves, mix all the other ingredients well with the softened rice flakes. Divide the mixture into small pieces and flatten each piece into desired shapes. Roast both sides it on a non-stick pan till it's done. If you wish to cook the cutlet on a regular pan, use a few drops of ghee or oil. Sprinkle coriander leaves on top and serve hot with mint chutney or tomato ketchup.